Selarang Camp Changi, Johore Bahru, Adam Park, Selarang Barracks Changi, River Valley Road Transit Camp. Saigon-Bangkok‐Singapore by aircraft, Singapore-Australia, no other details known. Soldier recovered from French Indo-China, Both Party. And how Jack was in French Indo-China. He was recovered from Saigon at the end of the war. Jack passed away aged 86yrs, August 1 2005, at Inglewood, WA. 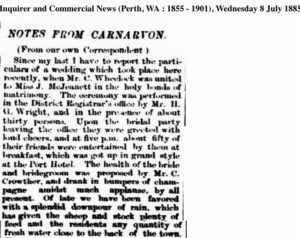 Please read list Carnarvon enlistments. 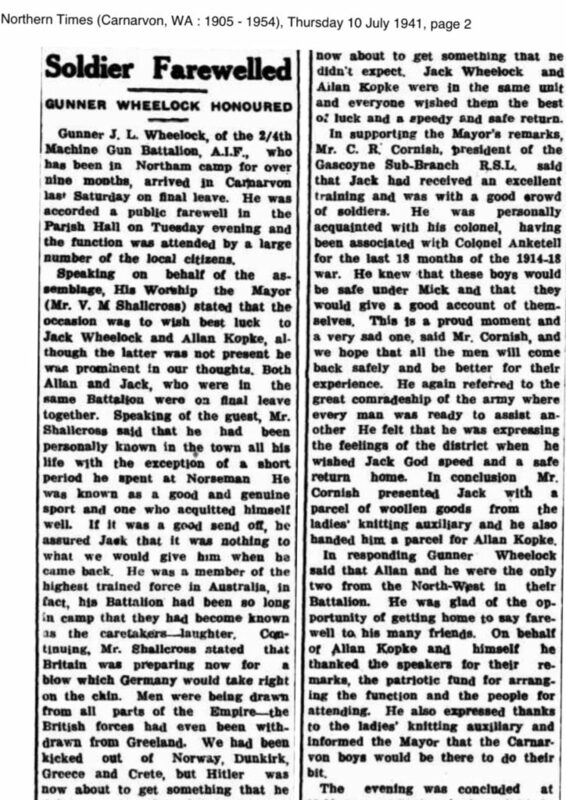 Below is story of Jack’s father Darcy, and others returning from WW1. Jack’s parents Darcy Logan Wheelock and Edna Elizabeth Iles married 1917. Jack was the first of two sons. 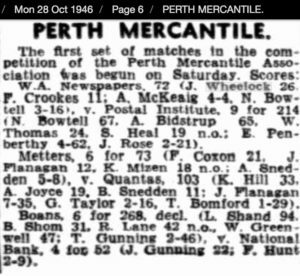 Ronald Henry was born 1921 and later Nevin and Betty. Below, death of Edna’s father. 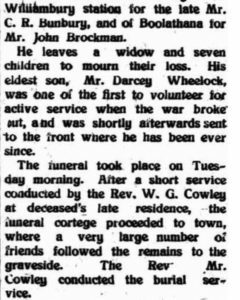 Darcy Logan had returned home from WW1 about March 1917. 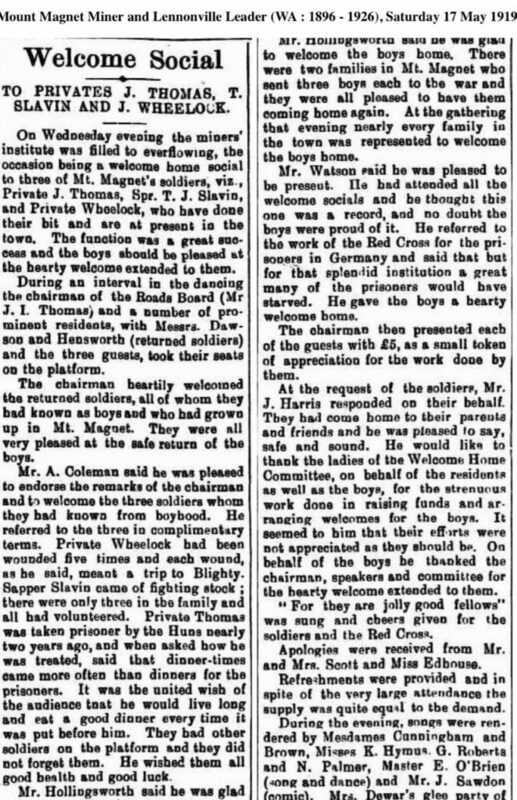 He had several years earlier on 21 October 1914, enlisted at Carnarvon aged 25 years, with 10th Light Horse, 1st Reinforcements. His occupation was teamster. Darcy embarked ex Fremantle on 17 February 1915. 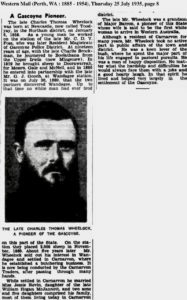 While Darcy was away at war his father Charles Thomas Wheelock who was born at Toodyay, died on 5 May 1916. 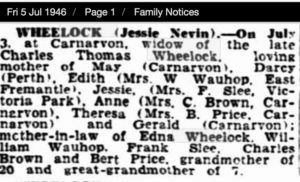 Darcy’s mother and Jack’s grandmother Jessie Nevin McJanet who was born 1864 Burr, Victoria married Charles Wheelock at Carnarvon 16 June 1885. 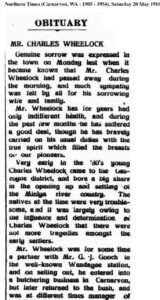 Jessie Wheelock died 30 years later on 3 July 1946 at Carnarvon. 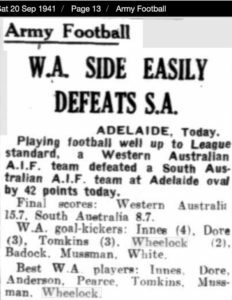 Darcy enlisted again 11 May 1942 at Carnarvon for WW2. W82129 Darcy was located at the General Details Depot. 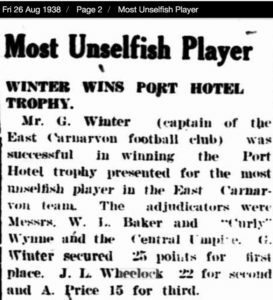 He died in 1962 at Maylands. Jack’s mother Edna died in 1984. 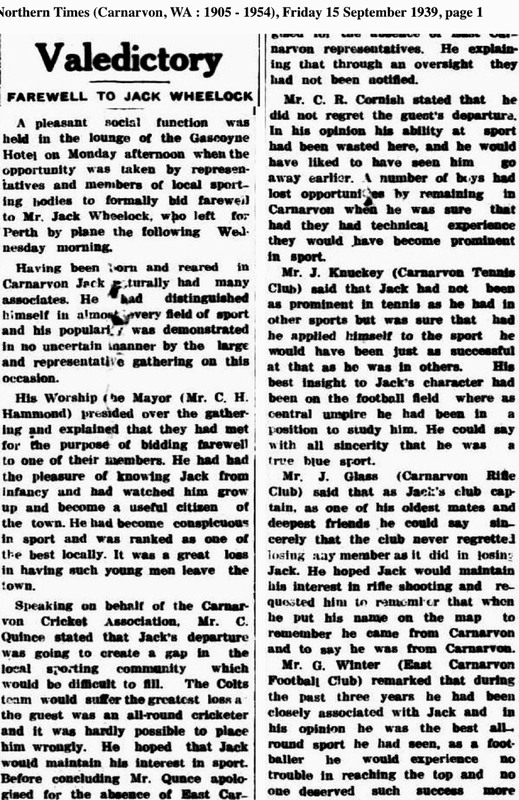 Jack and his brothers, were talented sportsmen throughout their younger lives in Carnarvon. Jack did very well at rifle shooting, football, cycling, swimming and cricket. It seems there was no sport he was not able to participate well. 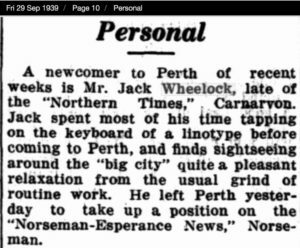 From working at Carnarvon Newspapers, Jack moved south. 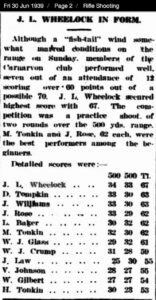 Below – Cycling results. 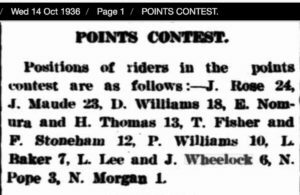 There were several cycling results from Carnarvon, this one, as others also, records Jack Maude – also from 2/4th. Maude WX13285, was a keen cyclist and originally a Fairbridge Farm boy working in the area. 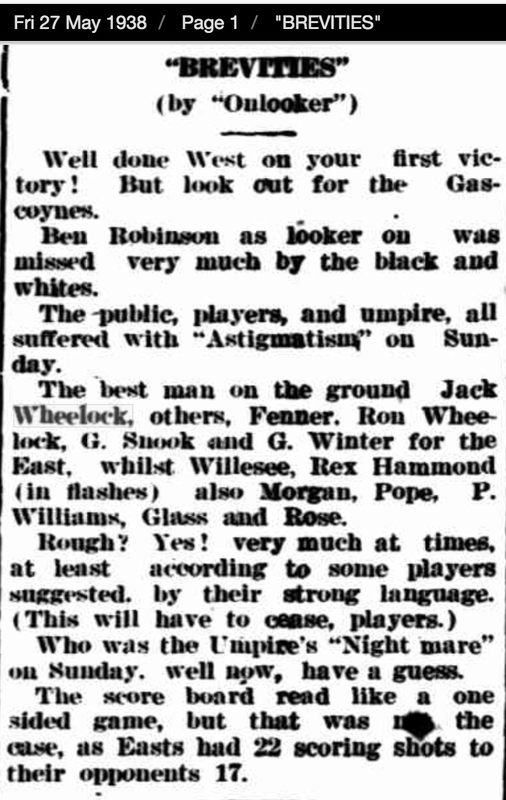 He was able to return to cricket after the war, representing WA Newspapers where he worked. 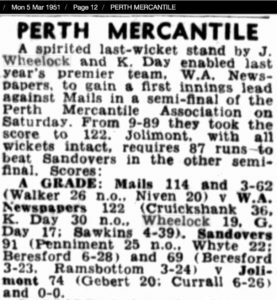 In his earlier days Jack was employed at the Carnarvon newspapers, and trained as a printer. He enlisted October 1940. He soon after joined 2/4th MGB, ‘B’ Company. 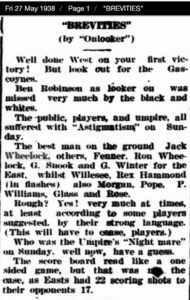 He was part of the successful Army Football team, and probably the cricket team whilst at Northam. 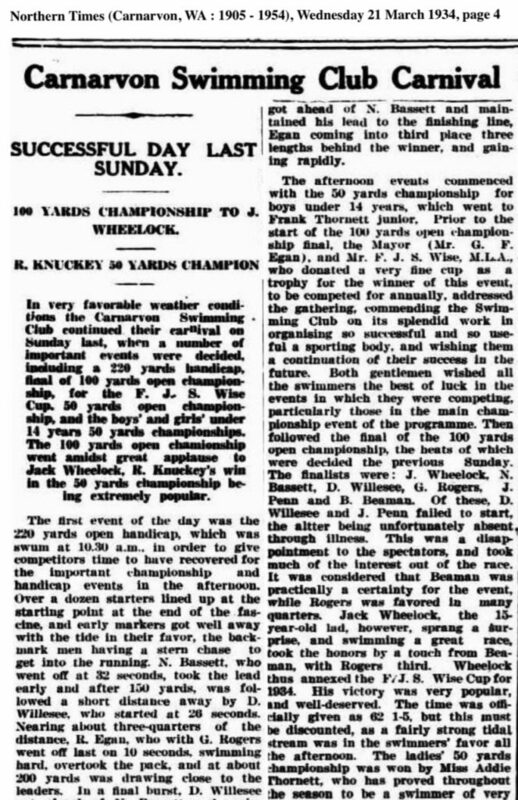 Please read story of 2/4th Football team. Jack married Avril Freeman in 1946. Avril died in 1999 and Jack in 2005 at Maylands. 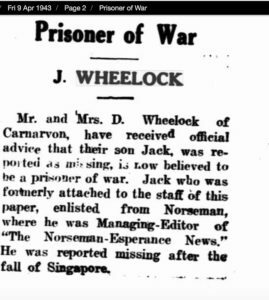 After the end of the war, Jack returned to his occupation printing at the West Australian Newspapers, where he remained until his retirement. He and Avril were residing in 1949 and 1958 at 95 Sexton St, Bayswater. His parents were also residing in Bayswater at 12 Ferguson Street. Darcy’s occupation was Stockman. In 1972 Jack and Avril were still living at 95 Sexton Street, however there had been some boundary changes of suburbs, because they were now in Inglewood. 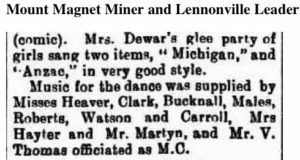 Their daughter Cheryle Delores was living with them and employed as telephonist/typist. In 1980 the Wheelocks continued residing at 95 Sexton Street, Inglewood and probably remained living here until Jack died in 2005. 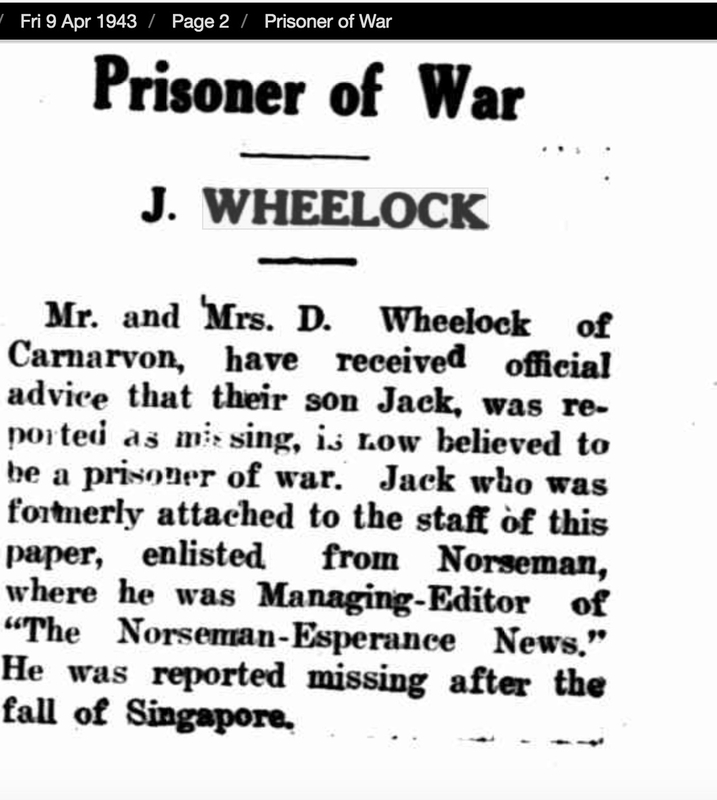 After the war, Jack learns of his mate Tom Fotheringham’s death at Borneo. Jack and Avril have a daughter. We do not know if there were other children.